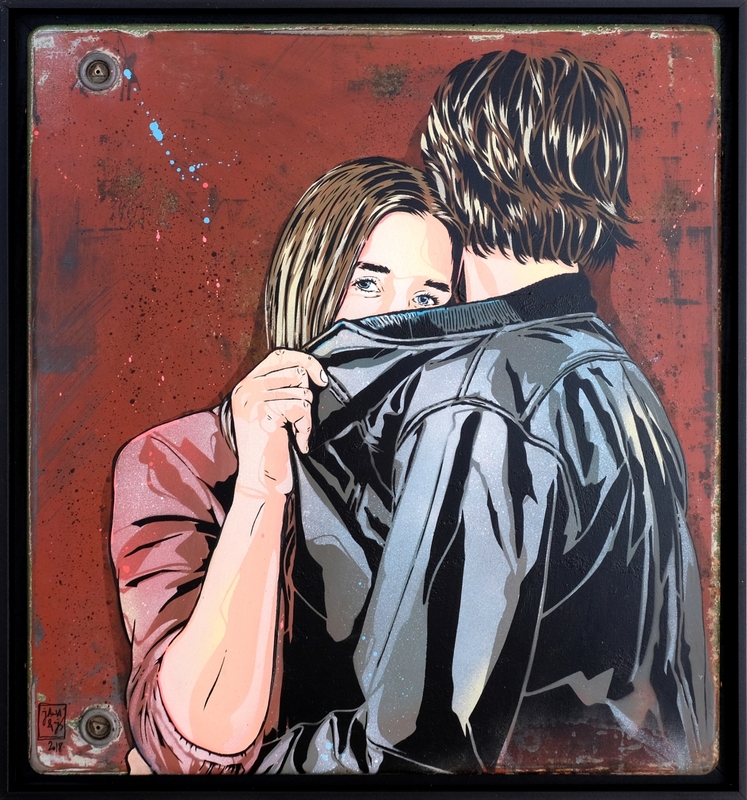 Concurrently on view in the Thinkspace project room is No Broken Promises, featuring new stencil and acrylic spray paint works by husband and wife duo Jana & JS. 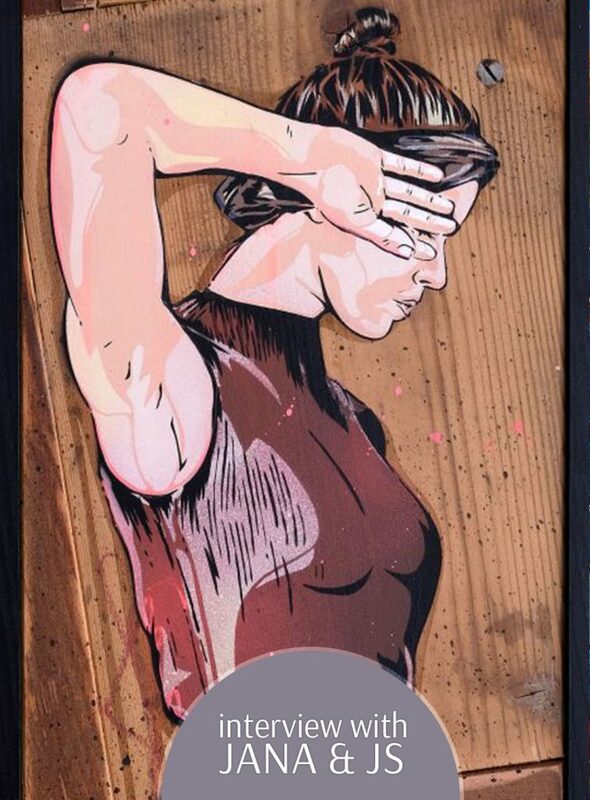 The French/Austrian pair, collaborating since 2007, has developed a stylized stenciling practice, often using site-specificity and portrait-based interventions into a city’s architecture to produce unexpected encounters. Working with existing structures and found materials, the pair explores the relational tension between past and present, new and old, static and variable. Based on their photography, these images often stage emotionally jarring or poignant figurative compositions, capturing unexpected moments of intimacy, disclosure, or tenderness in impossible or unlikely contexts. With the help of dramatic shifts in scale and contrast, the superimposition of these disarmingly vulnerable narratives onto the structurally immovable or permanent alters our perception of place. Ultimately, the pair modifies the reception of context by colonizing it with the meaningful assertions of personal experience. Jana & JS explore the position of the individual within the homogenizing expanse of the urban landscape and consider how that subjectivity must find a way to exist in spite of the potentially negating and impersonal nature of life in the modern city. Concise and impactful, Jana & JS’ works are bold, chromatic, and graphically circumscribed, recalling a quality of line essential to the language of print. Their insertion of the personal and emotive into the public domain disrupts its fundamental disavowal there, perhaps in the hopes of reassuring its continued expression and visualizing a politics of empathy. A duo working out of Austria, Jana is from Salzburg, and JS is from France, near Paris. 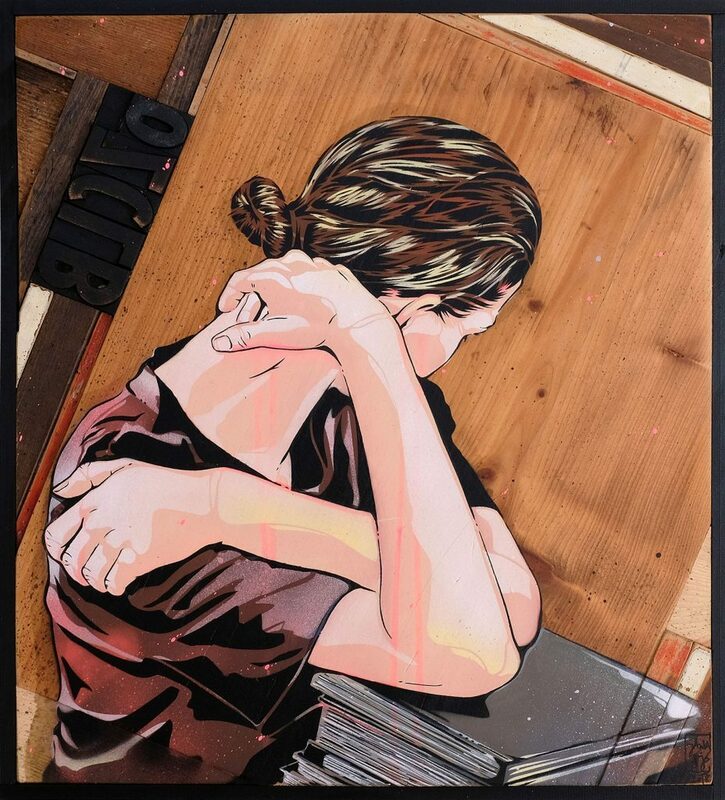 A couple, their work is stencil based, incredibly precise, and inspired primarily by their personal photographic work. 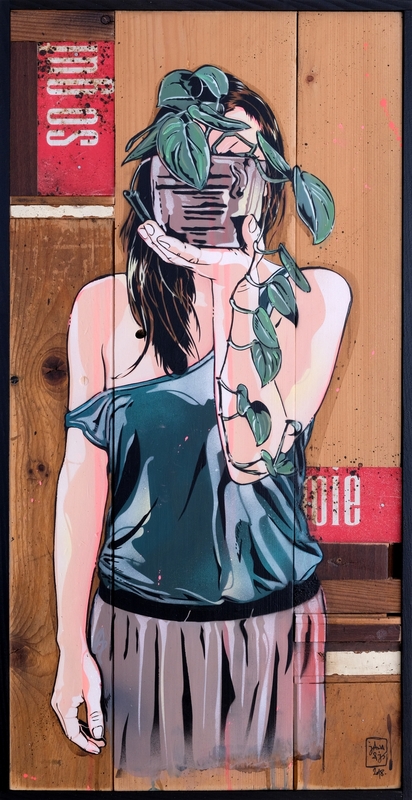 Interested in combining the figurative with architecture, their outdoor pieces are primarily found in major European urban centers and tend to vary in scale. 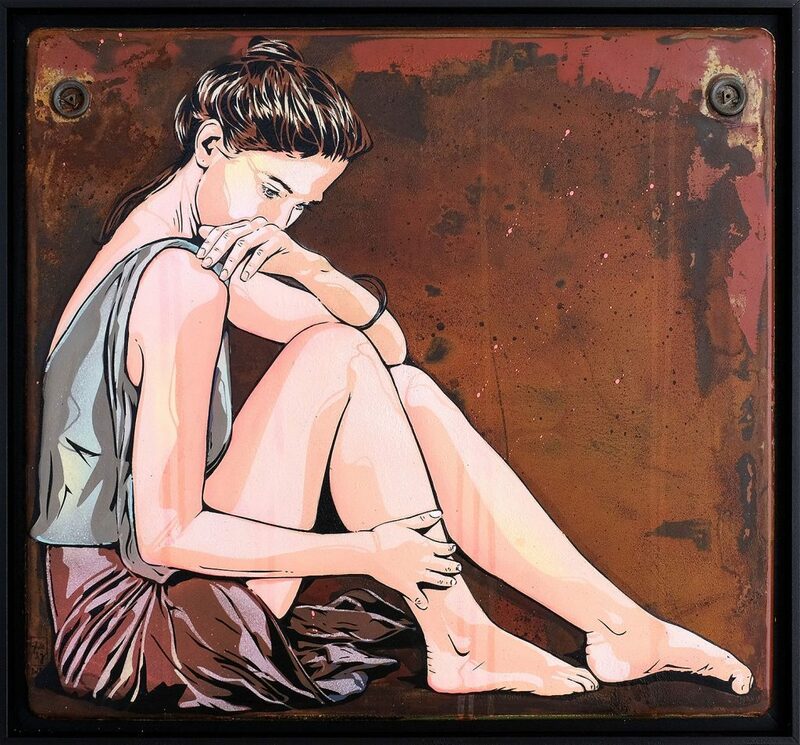 They work with a variety of media to create detailed stencils, using acrylic, ink, pencil, and spray paint on architecture, wood, glass, metal, canvas or paper. Creating these interventions in a variety of contexts, they have been known to use everything from trees in forests and railway tracks – to all manner of found materials. 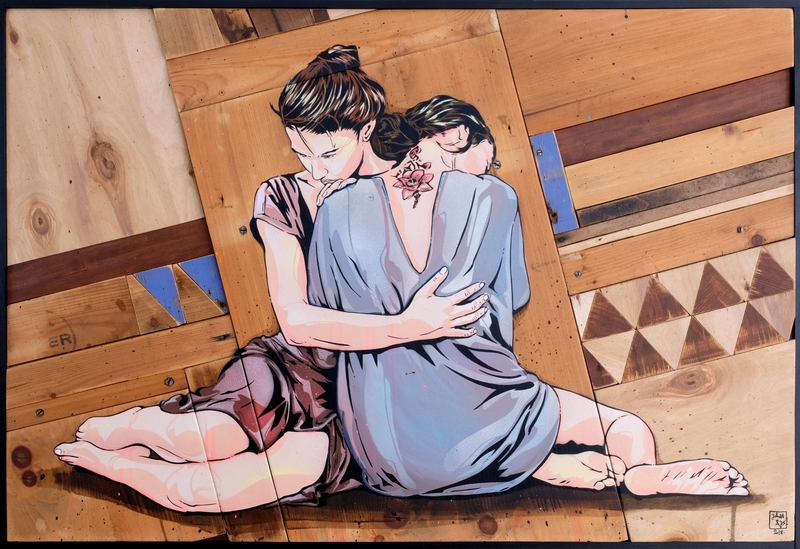 Often portraying people in pairs, their work is about intimacy and human connection, capturing a sense of vulnerability in the passing of time. Thinkspace Gallery in collaboration with Berlin’s Urban Nation, is pleased to present DUO, a group exhibition featuring works by internationally acclaimed contemporary art duos. The following is an exclusive Sour Harvest interview with Jana and JS. We met in Madrid in 2004. We were both spending a year in Spain and at some point we happened to live in the same apartment. Around this time, Js discovered the stencil technics by seeing many in the street of Madrid. 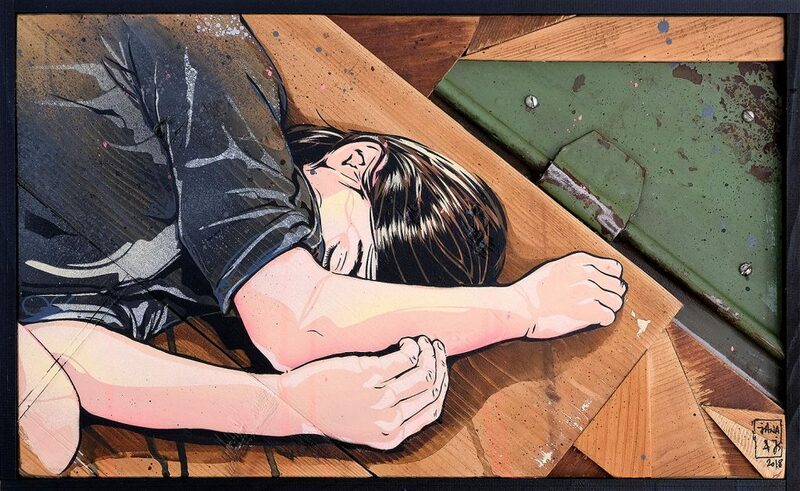 When Js later came back to Paris he discovered more about the street art and stencil scene in Paris. He met Artiste-ouvrier who shared with him his unique technic and founded the WCA collective. Back in Austria, Jana also started to cut some stencils on her own. We started to work together when Jana came to live in Paris. That is when we started to develop our actual work, inspired by our photographs, interest in urban architecture and portrait. Sometimes we don’t have the same idea or the same vision, but we are trying to slowly build something together. Conflict is often a part of our creative process. We think of it as something positive and the best way for us to work through it is to trust each other. At the beginning, we did not have any exact division in our collaboration; from deciding what image to use till the realisation of the painting – we were always working together. Things changed after having two children together and we started to divide our working process a little bit more. Nevertheless, there are some parts of the process we want to do together, for instance looking for new ideas, taking photos and cutting the stencils. The execution of the artwork happens in more separate ways, Jana is more into painting with brushes and acrylics, js with spray cans. Yes, we remember. Our first wall was in Paris. It showed the portrait of a photographer with an old industrial building from Paris we were fascinated by. It was in the street where we were living at that time. It wasn’t a masterpiece, but we were really excited about painting something together! We’ve recently watched “Only Lovers Left Alive” by Jim Jarmusch and we really loved it. We loved the ambiance, the decor, the symbolism. We are very excited to show more of our work in the US, in Los Angeles, with Thinkspace Gallery and in April in Chicago at Vertical Gallery. We are also so happy to have our first solo show in London coming up this year!! 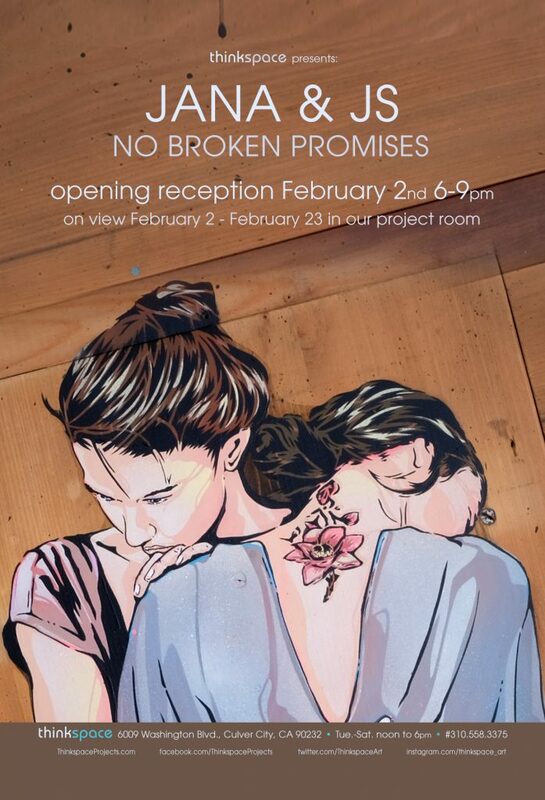 View new works from the duo Jana and JS during our opening reception for “DUO” Saturday, February 27th from 6 -9 pm. 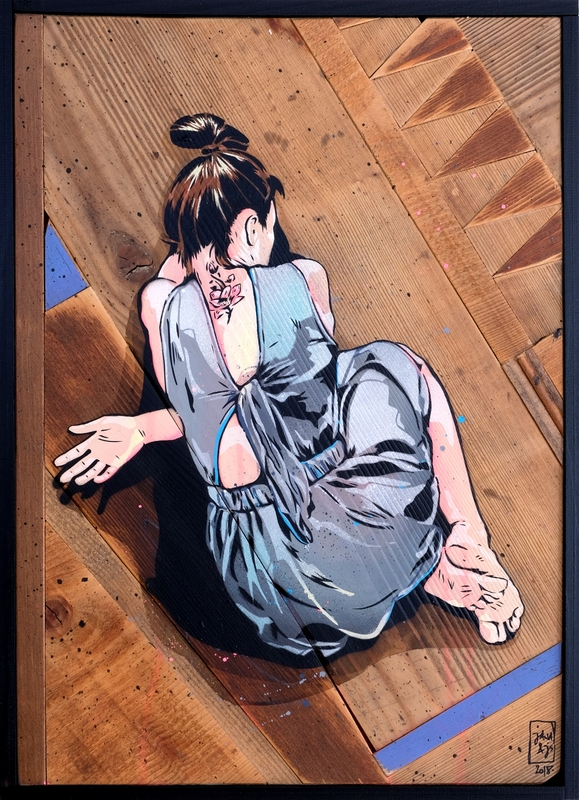 For additional information on the exhibit please visit Thinkspace Gallery’s website; if you’d like to receive a preview of the show make sure to sign up for the Thinkspace Gallery mailing list.